In stock -This product will ship today if ordered within the next 6 hours and 5 minutes. 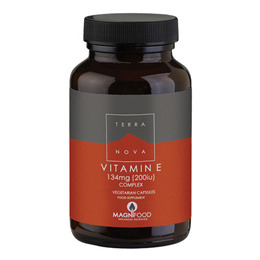 Vitamin E 200IU (134mg) Complex 100 Vegan Capsules. With MAGNIFOOD blend including Stabilised Rice Bran, Spirulina, Acai Berry & Sea Buckthorn. Below are reviews of TERRANOVA Vitamin E 200IU Complex - 100 Vegicaps by bodykind customers. If you have tried this product we'd love to hear what you think so please leave a review. Good product. The vegicaps are the right size for swallowing. They contain other ingredients that work with vitamin E and are good value.